Since this article was first posted on the website of the Vancouver Media Co-op, Alex Hundert and others have been warned not to speak to the media. We are reposting the article to share Hundert's words with a larger audience. VANCOUVER—In the wee hours of June 26, Alex Hundert awoke to the sound of police breaking down his door with a battering ram. Members of the gang unit entered his home in Toronto with guns drawn, arrested him and his partner, and took them to the now infamous temporary jail set up in an old film studio in Toronto. By the time the mass arrests began Saturday evening (June 26), Hundert had been transferred to the Maplehurst jail in Milton, Ontario. 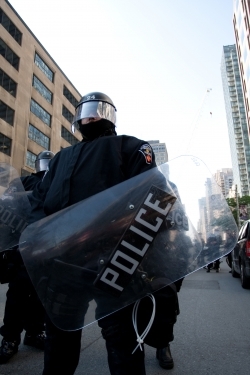 Over the next days, more than 1,000 G20 arrestees were put behind bars, including 16 more organizers and activists from southern Ontario and Quebec who face serious, trumped-up charges. This might seem a far cry from the life of a self-described former "ski bum" who grew up the older of two boys in a middle class Toronto home. But Hundert, who was released on bail July 19 and faces charges of conspiracy related to G20 organizing, can trace a line from his early activism right through to today. While studying at Wilfred Laurier University, Hundert's early forays into organizing were typical of many university students. "I was thrust into situations where these big, very effective organizing efforts—like doing campus fundraisers for popular causes such as AIDS—were happening and we'd get hundreds of people involved. But then everyone one would go home and feel that they'd done their part and everything was okay," he said. "I felt that no matter how much money we raised on a university campus, we were not really contributing anything to the solution." 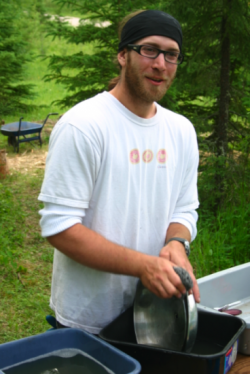 Providing support at the blockade in Grassy Narrows opened Hundert's eyes to a far more holistic form of activism, and deepened his analysis of capitalism and colonialism. "In Grassy Narrows, I got to see first-hand the extent to which many of the things we're told about this country are flagrant lies, and the extent to which the exploitation of resources and labour is synonymous with the destruction of communities," he said. Judy Da Silva, Asubpeeschoseewagong Anishinabe (Grassy Narrows First Nations), who has worked closely with Alex since 2006, attributes the growing movement of non-Natives in support of Indigenous land rights to the work of Alex and others in southern Ontario. But instead of being in Grassy Narrows, Hundert remains under house arrest at his father's home in Toronto. He jokes that he's been reading too much Chomsky, but says being jailed confirmed events he'd witnessed as an activist in support of Indigenous struggles. On the inside, other prisoners helped him fill out forms and navigate the prison system, which Hundert says is designed to dehumanize prisoners and their communities. But he thinks the attempt of the state to quash dissent through repression will have the opposite effect. "I think in the long run it's going to have the same effect that cracking down on legitimate dissent and the public voices of communities always has," said Hundert. "The effect is strengthening the resolve of that very voice." Already, people with no interest in political radicalism have been radicalized, said Hundert. "For every person that they are pulling out of the movement—to the extent that they're able to do that through criminalizing and incarcerating us—there are several people to take our place," he said. Hundert doesn't want a focus on the criminalization of activism to obscure the reasons people are in the streets. "Whether it's remote-controlled airplanes dropping bombs in Pakistan, or whether it's the OPP [Ontario Provincial Police] attacking Six Nations land defenders, or whether it's the Integrated Security Unit criminalizing so-called anarchists, it's all about the attempt to break people's resistance to an imposed order," he said. "It is important to question just how democratic or legitimate that order is, and lots of people know that, and hanging on to that conviction is just as important as being honest about the experience of criminalization." Though this has been a difficult time for Alex’s friends and allies, they remain firm supporters of his work. "Alex’s family and friends are proud that he is putting his future on the line in the service of social justice," said Amy Rossiter, a Professor at York University, in a letter of support for Hundert. "I think the most important thing we can do is to make space for those communities that have been most silenced in shaping the current system to facilitate a process of transformation with their voices, visions and practices," he said. The Kitchener-Waterloo Community Center for Social Justice, which Hundert helped found, is one example of creating that space. "Once we make space it is a lot harder for them to take it away, and no matter what they do to us, other people can join that community and culture of resistance and fill it with what they want." To support those still in jail and facing charges, donate to the legal defense fund. Dawn Paley is an organizer with the Vancouver Media Co-op. Submitted by Anonymous (not verified) on Thu, 2010-12-30 09:55.